Theoretically and physically, classrooms are borderland spaces by default. The combination of Hip Hop and Borderlands, as both spaces and orientations, never made more sense to me then when I got in front of a class. Intertwined, these two intellectual groundings complement each other, because Borderlands allow me to theorize my approach to teaching, while Hip Hop gives me tools for practice. The convergence of potential students’ experiences, origins, and personalities requires that we account for a space that honors all of these relations. To do so, I manage my classroom like an ongoing Hip Hop Cipher, where I perform both as an Emcee and a DJ. The Cipher is a sacred space of learning that requires participants to listen critically and rap in context. As the DJ, I aim to create a space for my crowd that is inviting and encouraging, primarily by providing a beat or foundation for students to work in. A DJ is present, but also allows the crowd to be the main attraction. Thus, I understand the role of a DJ to be similar to that of a project manager, a person who understands and navigates personalities and relations in the context of any given task. In this way, my interactions with students focus on understanding their strengths and applying them to their work. As the Emcee, I understand instructional moments as ciphers between myself and the theories and scholars relevant to the course. Like a rapper in a cipher, it is my job to connect the conversations happening around me, offering my expertise on writing, technology, and culture. For example, to connect digital and material writing practices, I incorporate Code Academy in my First Year Writing courses. By pairing an HTML/CSS language unit with a literacy narrative or rhetorical analysis, my students engage in two simultaneous writing projects. Throughout the project, I ask students to reflect and compare the experiences of working through each component in a classroom discussion. The use of coding allows diverse student groups to share a new experience while working on a traditional writing task that they are all familiar with. Our reflective conversations thus emerge from the borderlands space between coding and traditional writing, between something familiar and something new. Framed in this way, when having a class discussion, every student has the potential to contribute to the conversation, because they are all working from a relatively similar site of enunciation. By engaging the whole class, deeper conversations emerge, specifically about the differences and similarities between the two writing experiences. As a result, students discuss their attention and orientation to genre, audiences, input/output, and the freedoms and limitations of writing code and writing traditional print papers. I strive to facilitate productive and reflective experiences like these throughout my course, where students have a chance to practice new forms of composing while acknowledging their own positionality. These reflective discussions are measures of learning for me, because they allow students to both speak to their experience and make connections to wider concepts. In this way, these discussions are reminiscent of the freestyle rap ciphers in Hip Hop culture. Just like rappers combine their own experiences, observations, and countless hours of practice to produce good freestyles, students in my classes gain the ability to “freestyle” from their own lived experiences. Through this work, I aim to show students that their skills are not quite spontaneous, but are instead the result of learning over time and across contexts. In the scope of a graduate curriculum, the History of Rhetoric courses are important to help students orient themselves in the field while learning how the field has created its own story. In this course, I ask student follow a sequence that asks us to understand and question as Jacquelin Royster calls the disciplinary landscape. We begin with a unit on Historiography, then on to "the History of Rhetoric," followed by Critiques of the History, transitioning into "Histories of Rhetoric," and finally ending with new directions for History. This course draws on a Cultural Rhetorics grounding to make space for new landscapes. At the end of this course, I work with my students to understand what discourses or dialectics they hope to engage in and how they can write themselves into those spaces. WRA 150 is the general FYC course in the Writing Program curriculum at Michigan State University. The course follows a sequence of five assignments: Learning Narrative, Cultural Artifact Analysis, Disciplinary Literacy Project, ReMix, and Revising Literacy. Instructors have freedom to change the arrangement and tailor assignments as they see fit. Over time I shifted the course towards a final portfolio including reflections of each assignment (as they are assigned) and final reflection where students analyze their own reflections to discuss how their relationship to writing shifts on the assignment and over time. Additionally all grading rubrics are built with students in class to develop a literacy of assignment sheets and make transparent my expectations of student writing. This also gives students ownership over how they are being evaluated often skewing towards emphasizing content and analysis over mechanics. WRA 110 is a Science and Technology themed FYC course targeted towards majors in the hard sciences. In my course, writing is understood as a technology. Therefore students learn to understand how writing operates as a tool. Student build towards one major final research project that is scaffolded with deliverables starting in week 6. Throughout the semester students are given mini-projects to supplement their development as writers and researchers. Noteable mini-projects include the completion of an HTML/CSS language course online where students engage with writing in space that makes the interfaces of writing tangible. This leads to a discussion of the limits of writing as a technology and the role of language across writing platforms. Finally this encourages students to rethink how they present research in more traditional writing spaces. ENG 232 is a Creative Nonfiction is a writing course for mostly non-majors that values storytelling as well as the story. My course is themed around Hip Hop culture and Rap music. We exam writing from various perspectives and topics. While the course is themed around Hip Hop not everything is directly related to Hip Hop. In this reading and writing-intensive course, students learn storytelling and essaying techniques that develop a writing persona that is unique and in relation to contemporary nonfiction writers. The course emphasizes process, practice, and invention of writing. In this course we read the writings of Roxanne Gay, Ta-Nehisi Coates, selections from the Crunk Feminist Collective, Jay Z, Sherman Alexie, and Charlie Ahearn. Students produce self-directed final projects that are relevant to their major or future careers. Examples include Children or Young Adult stories, journalistic style essays, collections of vignettes, and press releases. Due to wide enrollment of majors and classification, this writing course is themed around Hip Hop in order to emphasize how personal experiences and place can inform not only the stories we tell but who is telling them and how. 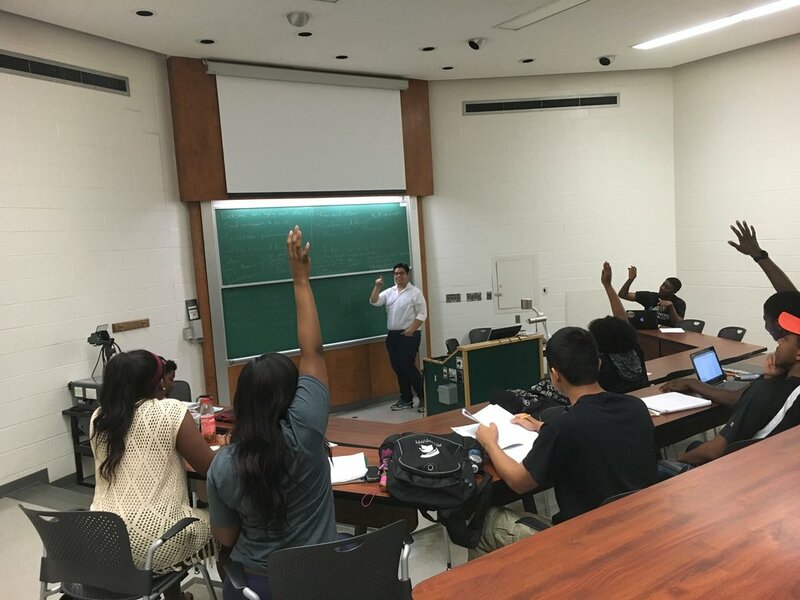 Students enrolled in the ESSA Summer Bridge Program take 3 course over the summer that introduces them to a college experience prior to starting in the fall. One of their courses is a Writing class designed to prepare and introduce them to First Year Composition at MSU. Success in FYC correlates directly to success in STEM majors thus this course is designed to be 6-7 week prep for their upcoming writing course. Divided into three-2 week modules the course emphasizes students familiarity with the key concepts of Rhetoric, Literacy, and Culture. Each concept is deconstructed over two weeks through readings, writings, and discussions that results in students developing a working definition of each key concepts. Students finish the course with a grounding in the discourses central to FYC at MSU.